Sandlock Sand Boxes, Sand Tables, Sculpture Tables, Accessories including water liners, umbrellas, covers and more for Indoor and Outdoor Play Areas, Perfect for Play Areas and Children's Centres in Hotels and Resorts, Daycares and Play Areas. We are proud to Offer SANDLOCK™ Sandboxes and Sand Tables are for commercial and residential applications. SANDLOCK™ products feature precision engineering that provides durability with a stylistic design. Commercial grade UV Stabilized HDPE Plastic. Patented interlocking construction eliminates sand leak. Quick assembly, easy to clean and with a 10 Year warranty on the solid Plastic. Sand and water play can provide hours of interactive group and individual play. These products promotes co-operation, small motor skills and tactile experiences. These durable, easy to assemble, Sandlock™ Sand boxes and Sand Tables are a great addition to any children's program. 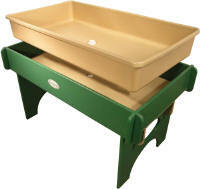 Accessories add extra play value to these products including water tub, umbrella and hard tops. Covers also available. 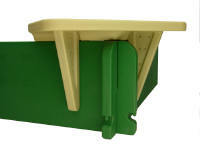 New Ground Level Sandbox features precision engineering that provides durability with a stylistic design. Commercial grade UV Stabilized HDPE Plastic. Patented interlocking construction eliminates sand leak. Quick assembly and can be secured to any surface. Puncture resistant ground barrier keeps sand and ground materials separate. Comfortable removable seating that doubles in lifting cover to create water run-off. CoverLock System and versatile umbrella bracket for quick shade adjustment and umbrella available separately. CUSTOM ORDER - PLEASE ALLOW 6-8 WEEKS. Interlock the possibilities. Group multiple SandLock Sandtables at varying heights and sizes to create an interactive sand play area. 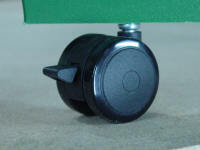 Features: rust resistant, installs on any surface and has great wheelchair accessibility. Posts and support brackets are powder coated, providing a rust resistant protection to maintain quality appearance for many years. Permanent Installation. ADA Compliant. Fitted cover: Heavy duty, 16 oz. vinyl. Creates water run-off by storing seats inside sandbox. Fitted cover. Heavy duty, 16 oz. vinyl. Bound with elastic, the cover goes on like a shower cap. 60" span, adjustable height. White powdercoat post. SLT-2747HT - SANDTABLE HARDTOP - 27" X 47"
Solid Fitted Table Top that fits onto Sandtable to create a hard play surface.